On August 31 of this year Kyle Willis, a single dad and aspiring paralegal in Cincinnati, Ohio, died from an infection in his tooth that went to his brain. He did not have dental insurance, so when his toothache became severe, he sought relief in the emergency room. The doctors there could do nothing for him other than prescribe medication. Kyle’s story is tragic, but it is not unique. Every day, adults suffer needlessly from dental pain and infection because they do not have a way to pay for routine preventive and restorative dental services. The data paints a grim picture. A recent study showed that 52 percent of new armed forces recruits had oral health problems that needed urgent attention and would delay overseas deployment. Other studies show that unmet dental needs are a primary reason adults visit the emergency room. In Kansas alone, 17,500 individuals sought care in emergency rooms for dental pain last year and received only medication to treat the symptoms of dental disease, not the cause. Countless Kansans are left with no solutions to their dental problems. 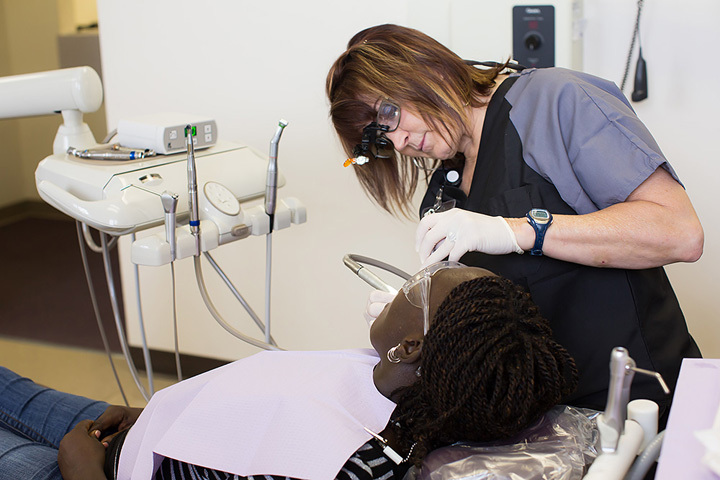 Employers are less likely to hire people whose appearance is affected by dental disease. Kansas Working Healthy participants cite the need for dental services as one of the biggest barriers to getting and keeping a job. Each year employed adults lose more than 164 million work hours due to dental disease, its associated pain or dental visits. Dental disease is a communicable, lifelong infection. A 2000 Surgeon General’s report and numerous subsequent studies show a strong link between dental health and diabetes, heart disease, pneumonia, and pre-term births. Individuals with chronic disease who are unable to maintain healthy teeth and gums often exacerbate their health problems, leading to painful and costly medical interventions. In 2006 and 2007 the Kansas Legislature appropriated funds to pay for dental services for adults on the Medicaid Home and Community-Based Services waivers. This meant dental services were accessible to thousands of people with disabilities and elderly Kansans. These individuals were able to be proactive about their own dental health because they had a way to pay for the preventive and restorative services they needed. At that time, an elderly Kansas woman who had extreme dental problems and had lost most of her teeth began spending all of her time shuttered in her home, and her health began deteriorating. She was unable to eat healthy foods and was embarrassed about her appearance. When an Area Agency on Aging helped her get dentures through Medicaid, she began to eat well again, and, more importantly, she began to smile again. Today she is an active member of her community and spends a great deal of time out and about with her friends. In 2010, in the wake of massive state budget cutting, those services were eliminated. Many individuals were in the midst of dental treatment plans that had to be halted and have yet to be resumed. State officials estimate it would cost $4.3 million state dollars to begin providing routine, proactive dental services to the adults eligible for the Kansas Medicaid program. The state dollars would be matched with $6 million federal dollars. The total cost represents just 0.375% of the annual Medicaid budget. To join Oral Health Kansas, Inc. in advocating for a dental benefit for all Kansans eligible for Medicaid and to improve access to dental providers, please contact Tanya Dorf Brunner at tdorf@oralhealthkansas.org or 785-235-6039.